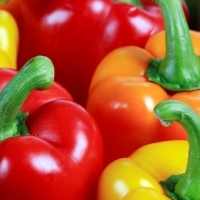 Bell peppers are the blocky, bell-shaped vegetables that usually range in size from 3 to 5 inches in diameter and 4 to 6 inches in length. 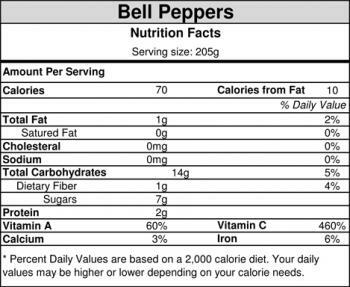 Bell peppers contain a recessive gene that eliminates capsaicin, the compound responsible for the 'hotness' found in other peppers. In a bowl, combine the scallops, olive oil, lemon zest, and black pepper, to taste. Preheat the broiler or prepare coals for outdoor grilling. Cut the bell peppers in half lengthwise and remove the stems, seeds, and ribs. If cooking in a broiler, place the peppers cut side down on a baking sheet. Broil or grill the peppers until blackened, 6 to 10 minutes. Transfer to a paper bag, close the top and let steam for 10 minutes. Remove the charred skins and cut the peppers lengthwise into 3/4-inch strips. Wrap a pepper strip around each scallop to cover completely, overlapping the pepper ends. 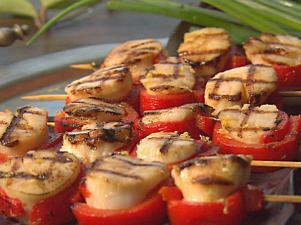 Secure the strips by running a 10-inch metal skewer through the scallop and pepper. Use 6 skewers; add scallops to each skewer until filled. Grill skewers over a medium-hot fire, turning once, until scallops are almost firm to the touch, 1 to 2 minutes on each side. Alternatively, cook under the broiler for about 3 minutes per side.